So after the workshop, I've decided to ban myself from any major digital painting projects and 3d projects and focus more on drawing and painting. In the past, I was never much of a fan of traditional painting. Since the workshop, however, this has changed! I can't remember if it was Jason or Ron that recommended just going out and buying paints and start mixing. It doesn't have to be any sort of painting, just squares with mixed paint. So for the next two weeks, I will be locked in a vacancy with no one around during the day here in Dallas. I figure it's a perfect time to dip my feet in! I guess I don't really know where to start though. What paints? Canvas? Materials? I know to not buy the expensive stuff to begin with but I really don't have a clue as to what to look for. you could begin with whatever colour mediums you want,but i must say the best to start with i have found are acrylics.you can either use them like oils or mix them with water like watercolours.sometimes you can scratch them away from your pictures(you have to scratch hard though) and they're easy to wash out of clothes(from what i know). also i wouldn't begin with canvas.i have recently started with colours also and i haven't done one picture on canvas yet-because i don't feel ready for it yet. i suggest you take some strong paper instead and test the different possibilities of the different colour materials(as i said i'd recommend acrylics)-and when you feel ready you want to start a bigass fantasy picture(or whatever) you can move on to the canvas.i dunno really but i think canvas is pretty expensive also,and one shouldn't necessarily use it for starting and experimenting with colours for the first time. Thanks for the info Carnifex. That's the kind of stuff I was looking for. So I started with acrylics today doing tints. I forgot to buy black acrylic. I bought one of those starter pack thingies and didn't notice that black wasn't in there. I also bought some strong paper and paper-palette stuff. -What are some decent quality brushes that are somewhat inexpensive? The brushes I bought are already falling apart. -How quickly do yall go through black/white? I chewed up a good portion of the white tube today and I would expect that black would be similar? -When mixing colors, do yall mix with out-of-the-tube colors each time or just add to pre-mixed colors? Like if I wanted to lighten the green a bit, do I try to lighten what has already been mixed or do I start again trying to lighten the green fresh out of the tube? I know these are beginner questions but I'm working to remedy that. Thanks for any feedback, it is most appreciated. I messed up on a couple of area and the last 2 columns were me just messing around. I'll have black tomorrow. Last edited by Gonzo; June 24th, 2004 at 04:39 PM. 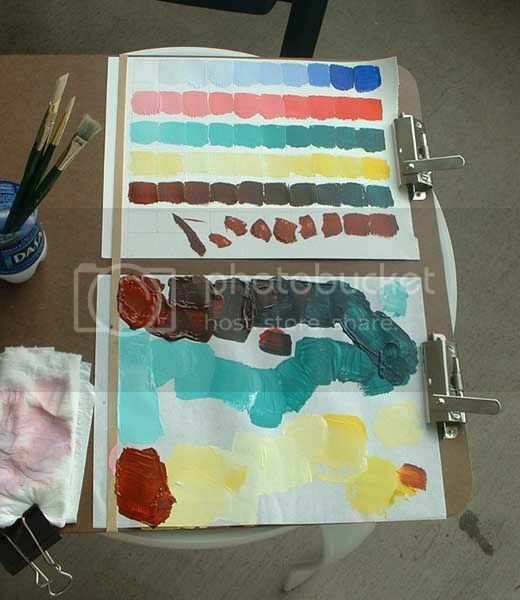 one thing you should do is pick your pallette, some people prefer to paint with more colors than others, but i think it's best to stick with 5, get a BIG tube of white, a nice blue,(which will act as your black) a yellow (ochre perhaps), a burnt umber or sienna, and a red (possibly indian or alizran crimson). stick with those and mix the hell out of them, see what colors you can make. also do a search on these forums, there is a TON of valuable info in the life drawing section here. just keep practicing. Its color theory class all over! Tints, shades, intensity...! I agree with Capt.Harlock that having a limited palette is a good start. In my experience I haven't found any decent quality brushes that are somewhat inexpensive that I like. As for how much white or black paint I use depends upon the medium I am using. For acrylics I use alot of white but never black. Watercolor I don't use either white or black. Lastly for oil paints I use a large amount of white and a medium amount of black. As for mixing paint I mix what I already have on my palette. I'll only mix a fresh batch when I am looking for a specific type of color. Hope that helps. Thanks for the feedback fellas. I'll forego buying black and use blue for the time being. I am going to stick with acrylics for the time being because that's what I bought.